Here you can find information about some of my favorite Net Entertainment slots, along with screenshots of the paytables and some of my personal wins playing with real money. This is just a small sample of the slots found at Net Entertainment casinos, there are many more great games available with the same quality graphics. All the info about these slots is from my personal experience, if I say that a slot seems to pay out or give bonus features more often, it’s just what I have noticed after many spins on these games. Guts.com Casino has over 550 games from 11 different software providers, including all of the best games from Net Entertainment. There are many casinos that have these slots, but Guts Casino is easily my favorite due to their fast withdrawals and high trust factor. Feel free to scroll down to browse the various Net Ent slots, or click on specific ones from the list below. 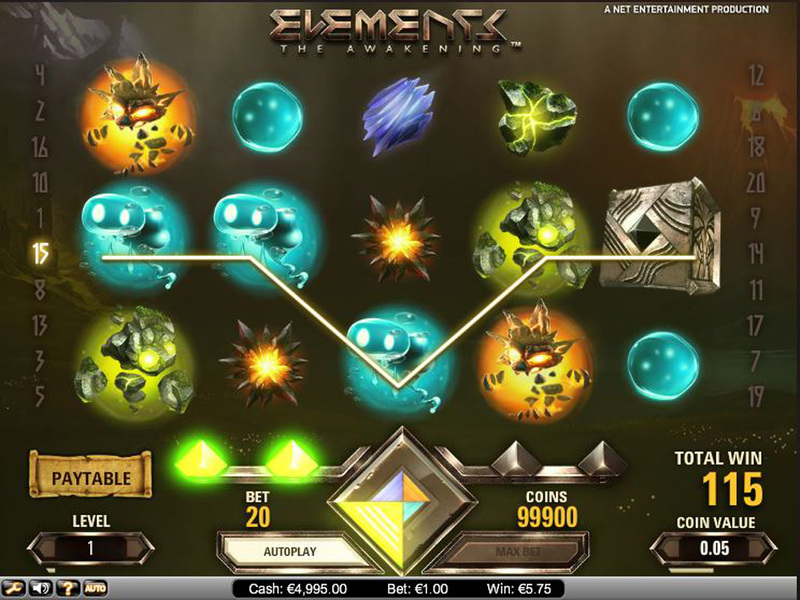 Elements is a new slot game powered by Net Entertainment based on a futuristic theme with creatures that are out of this world. 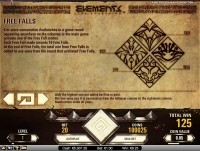 It starts with a short introductory video that points out the elements and their role in the game. The graphic is breath taking and has the wow factor. An important characteristic is the fall that replaces the traditional spins. Its purpose is to grant access to great features and bonuses. The layout is simple, with 5-reels and 20-paylines. The symbols are fully animated and include the four elements: fire, earth, water and air, that explode when you get a winning combination. The sound effects are perfectly combined with the interactive avatars. The coin sizes range from $0.01 to $0.50. The minimum bet is $0.20, while the maximum is $100. An interesting aspect of this game is the auto play mode. 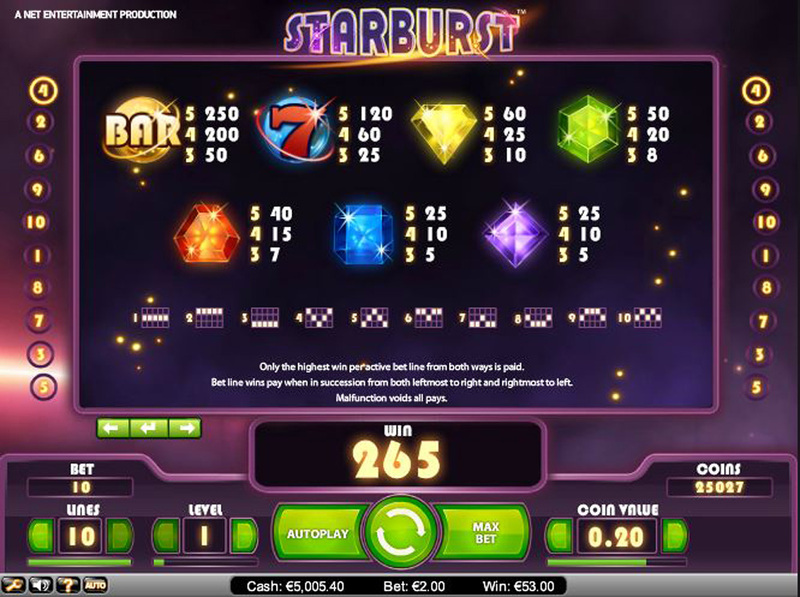 It allows you to select various aspects, like the number of spins, when to stop, the winnings and even the free falls. 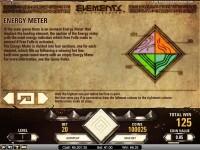 The Avalanche meter is located at the bottom of the game. Each successful spin lights up a certain part. The colors displayed match the main elements of the round. 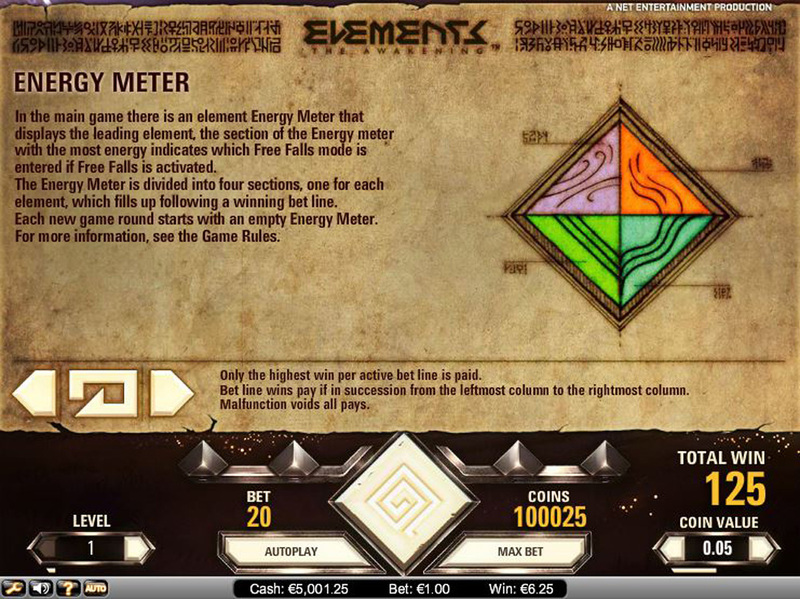 The Energy meter is divided into four parts, each for a certain element. When you manage to light up all four parts, you trigger the Free Fall feature. The colors displayed match a certain element, providing valuable data regarding which feature will be activated. The Free fall feature is activated when you get four or more Avalanches in a row. 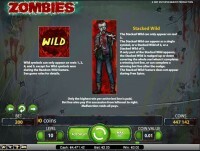 It grants access to 10 free spins and different wilds. 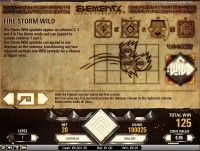 There are 4 wild symbols in this game. They can appear on any reel, except for the first one. Their property is to substitute any other symbol, except for the scatter one and to guarantee the highest paylines. 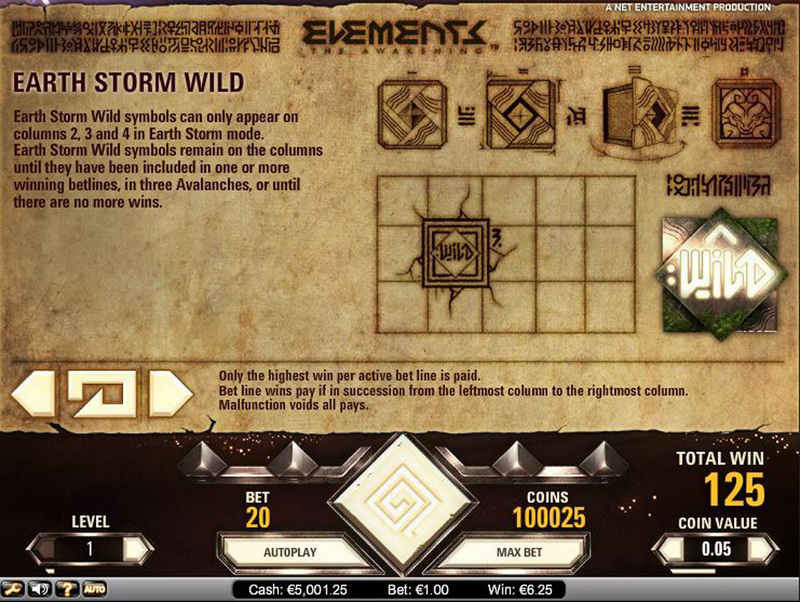 The Fire Storm Wild generally appears on the reels 2, 3 and 4, but it can expand on all the columns. It can spread in any direction, and it can turn other symbols into wilds. The Air Storm Wild is triggered when the Free Fall feature is activated. It remains on the screen for the whole process, moving its place after each spin. The Earth Storm Wild can only appear on the reels 2, 3 and 4. Once it is triggered it remains on the screen until the free fall feature ends, or you get a winning payline. The Water Storm Wild has the property to expend on the whole reel, thus it can visibly increase the earnings. Elements is indeed a spectacular game. The theme and graphics are not something that you see every day. The sound is really relaxing and mimics different animals. I really like the way the elements fall, and they seem like floating, giving an authentic look. It is not very hard to hit the free spin feature, and the four wilds are incredible. You can play Elements at Guts.com Casino (read my review of the casino here). 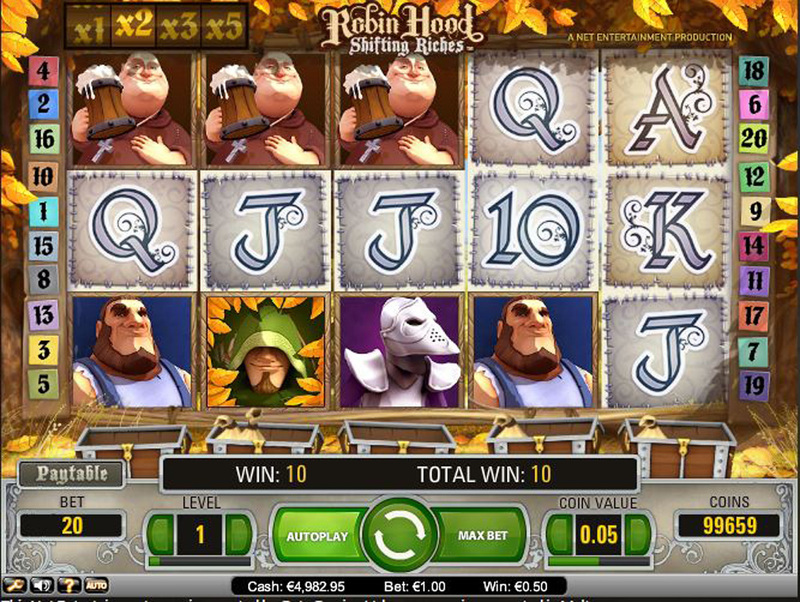 Robin Hood is an online slot from Net Entertainment that is based on the story of the famous thief who stole from the rich to give to the poor. 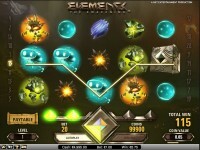 It includes a series of bonuses and features that manage to keep the players entertained for hours. The layout is simple, with 5-reels and 20-paylines. The symbols on the reels embody Robin, some of his fellow merry men, and also his opponents, the knights. The coin sizes range from $0.01 to $0.50. A particular aspect of this game is the fact that it has replaced the traditional reels with spinning ones. This means that once you hit a successful betting line the reels will shift to the right. 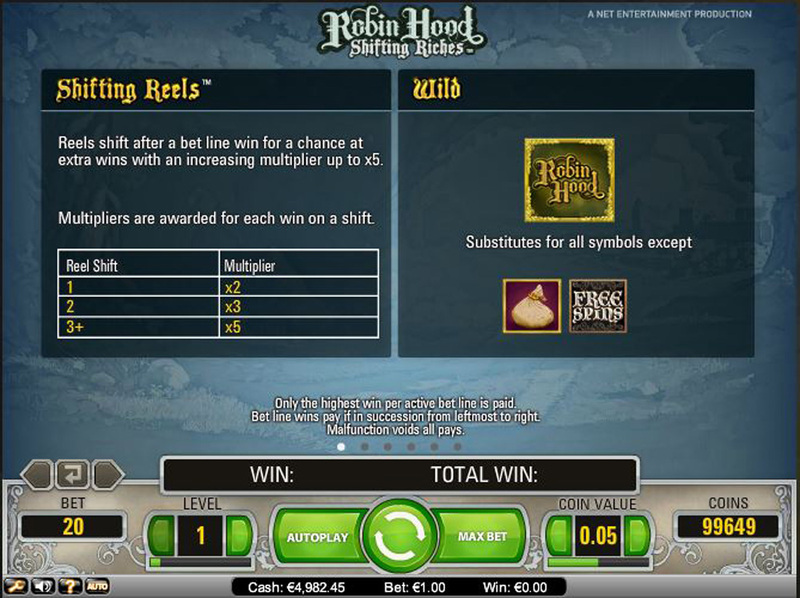 The Robin Hood symbol is the wild symbol, it substitutes for all symbols except for the money bag and free spins. The Shifting Reel feature is activated when you get a successful combination. In this case, the reels move to the right, allowing you to get consecutive wins. Moreover, it includes multipliers from 2x to 5x. A lucky symbol is the money bag. 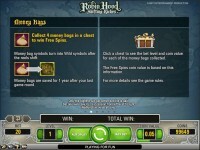 You will receive it straight from Robin, and you can guard it in the treasure chests that are located under each reel. A useful thing about this symbol is that the money bags you win are saved for one year, so you do not need to worry about losing them after you quit playing. 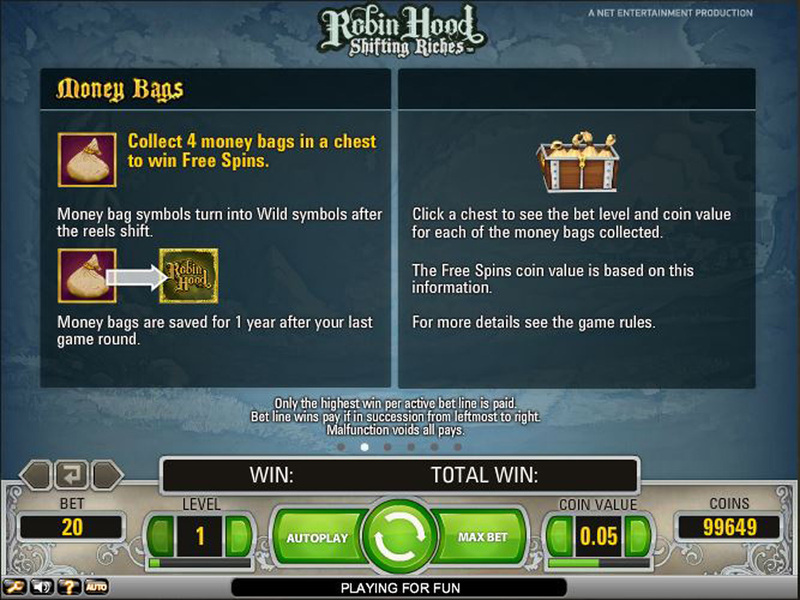 The Free Spins feature is triggered when you manage to gather 4 money bags in the same treasure chest. Once it is activated you can click on it and see the number of coins in the bags. 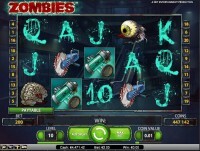 You can also enjoy 10 free spins and the opportunity to win 5 more if 2 free spins symbols stop on the reels 3, 4 and 5. The amount can double if you get 3 symbols. 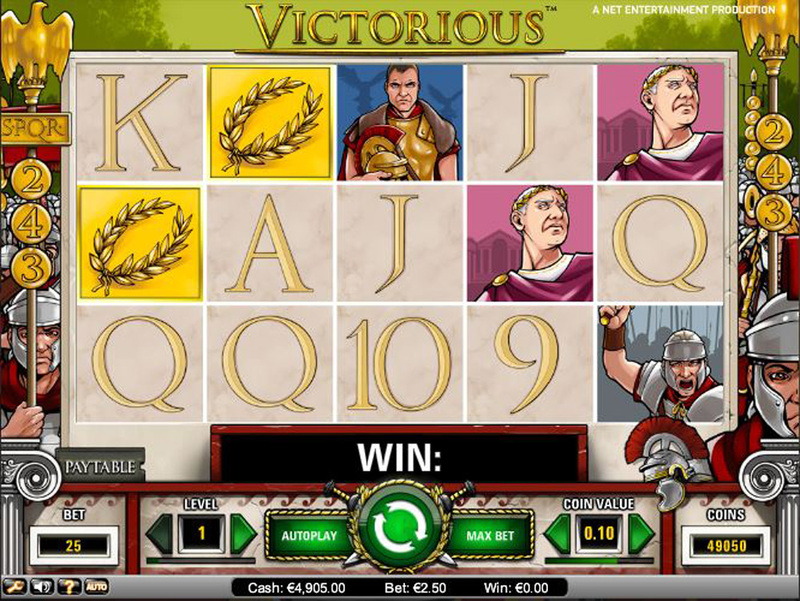 I have really enjoyed playing this slot game. Collecting money in the treasure chest is a piece of cake, and the winnings are quite impressive. The theme is also captivating, and the introductory part manages to transpose you into the world of Robin Hood. The sound effects complete the entertaining atmosphere. You can try it for yourself and see whether you like it or not. You can play Robin Hood at Guts.com Casino (read my review of the casino here). 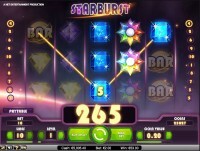 Starburst is an online slot from Net Entertainment, released late in 2012. Though the name promises much, this slot is quite simple in design and theme. 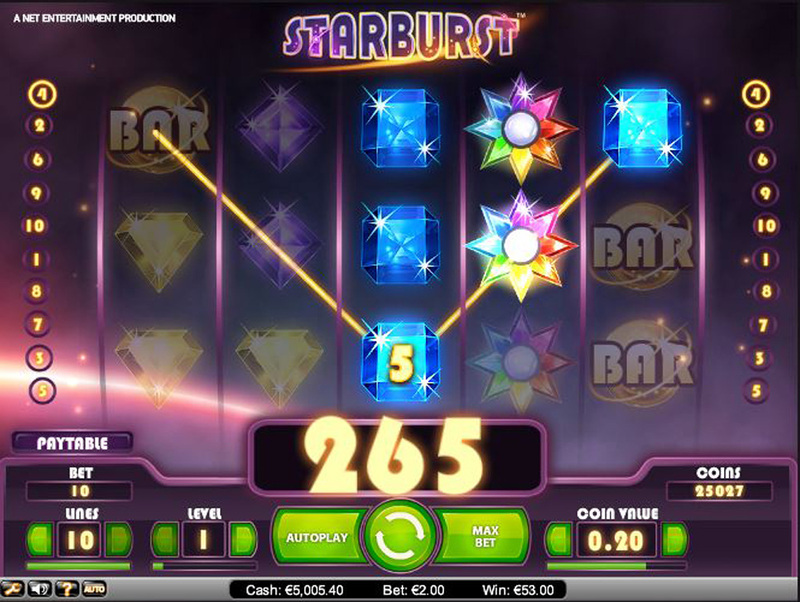 It has the traditional gems, bars and red sevens, but the game uses a modern approach and is far from a traditional slot machine. The sound effects and the cosmic background bring an out of this world sensation. The layout is very simple, with 5-reels and 10-paylines. The coin sizes range from $0.01 to $1. You can opt to wager 10 coins per line, making the minimum and maximum bet range between $0.10 and $100. An important advantage of this game is the high return of over 96%. As the risk of losing money is low, it is a good fit for all types of players. 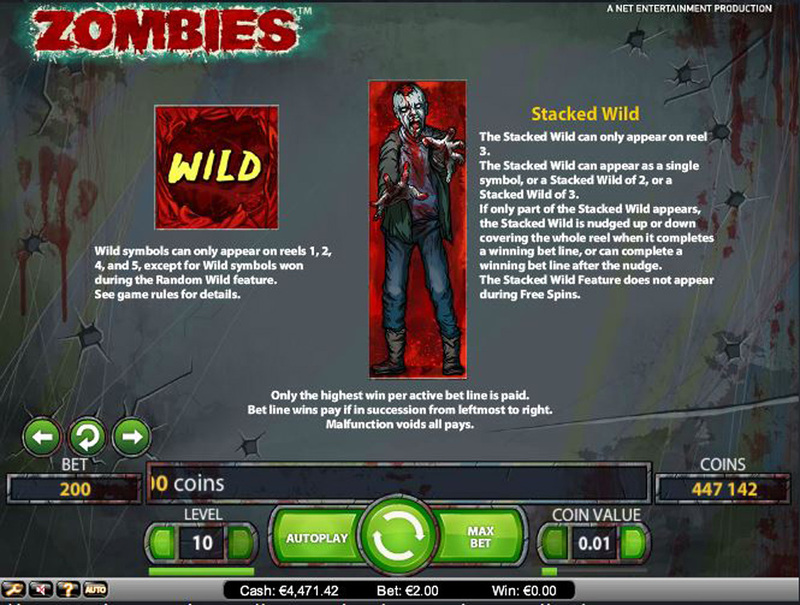 The wild appears randomly on the middle three reels and helps you qualify for a good payout. Its property is to substitute any other symbol and trigger the bonus feature. 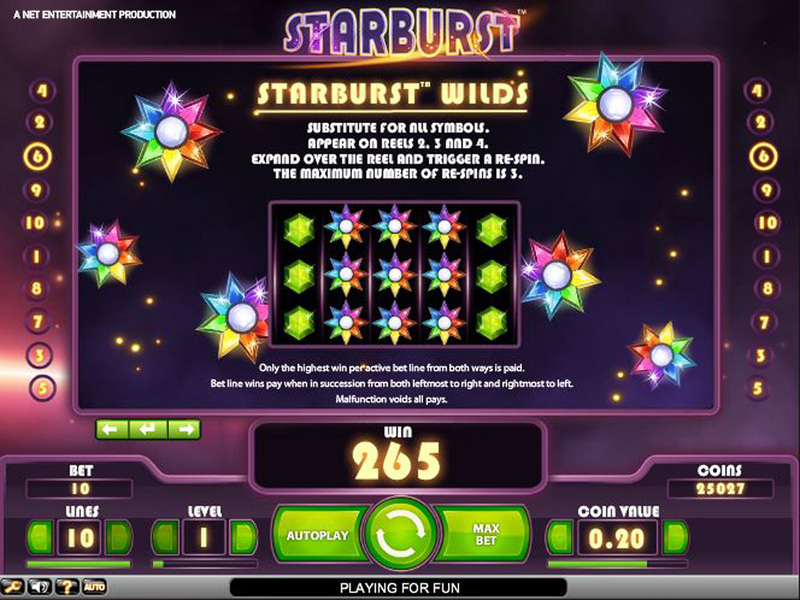 The Starburst Wild feature is triggered when a wild symbol lands on reel 2, 3, or 4. The wild expands to fill the entire reel and triggers a re-spin after the current win is tallied. If another wild lands during that re-spin, it will also expand to fill the reel and trigger another re-spin with all current wild reels remaining in place. If two wilds land on the same spin, both will expand to fill their reels, but only one re-spin is triggered. That bonus feature can obviously generate some huge wins. With the three middle reels filled with wilds, you’re guaranteed a nice win… get lucky enough to land Bars on both end reels and you’re laughing all the way to the bank. I really enjoy playing this game, it was the first slot I played that was created by Net Entertainment. It is amazing to see how such a plain theme can lure you to play more. Maybe one of its greatest plus points is the easiness of winning money. It is true that it lacks in special effects, compared to other games you can find on the market, but it has that special something in its simplicity. It is totally worth it to give it a try. 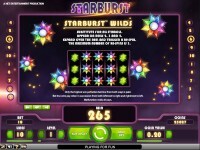 You can play Starburst at Guts.com Casino (read my review of the casino here). Victorious is an online slot from Net Entertainment. It is based on an ancient theme, the time of the Roman Empire. 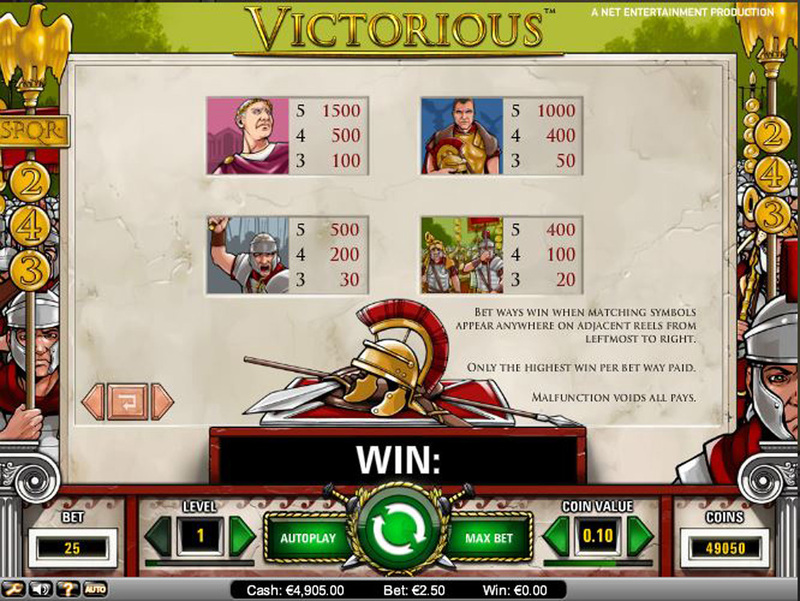 As this impressive civilization is mainly known for its great conquests and gladiators, the graphics and sound effects manage to transpose the players in the atmosphere. 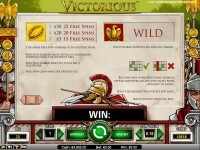 The name of the game quotes the cry of victory of the famous Emperors. The layout is simple, with 5-reels and 243 ways to win. As there are no paylines, all that is necessary in order to increase your earnings is to get a combination of 3 in a row. The symbols, though they are rather elementary and comic-like, bring together the major Roman emblems: soldiers, centurions, laurel wreaths, Caesar and eagles. The coin sizes range from $0.01 to $0.50. In this case, the winning combinations can be either up and down or from left to right. The minimum bet is $0.25, while the maximum is $125. An interesting aspect of this game is the fact that the value of the symbols are linked to the Roman military hierarchy. This means that the emperors are best rated, while the legions have a lower value. The wild symbol of the game is a gold eagle. Its property is to substitute all symbols, including the scatter. That’s definitely one of my favorite things about this slot, it’s rare to see the wild substitute for scatter symbols when 3 scatters will give you free spins. The Free spin feature is triggered when you get 3 or more scatter symbols in succession across the reels. The golden wreath is in this case the scatter symbol. This bonus round multiplies your earnings with 3. 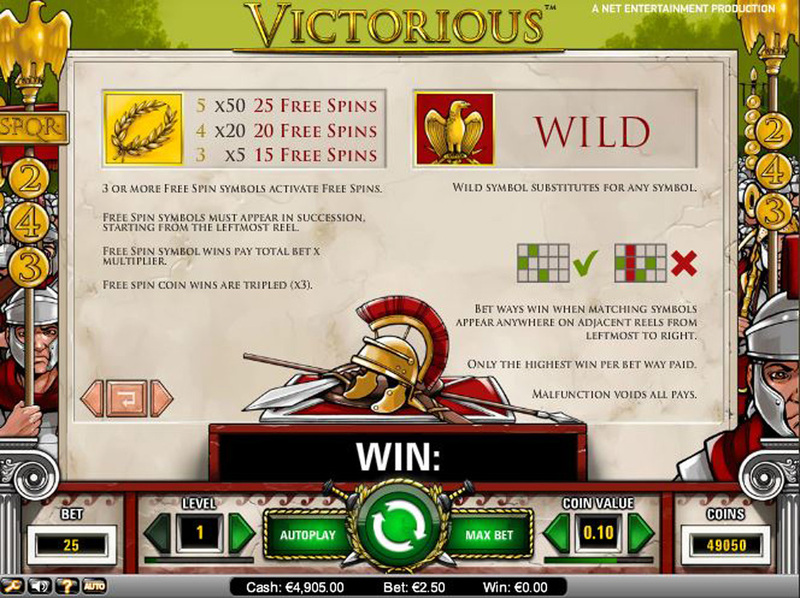 Furthermore, you can win additional free spins. 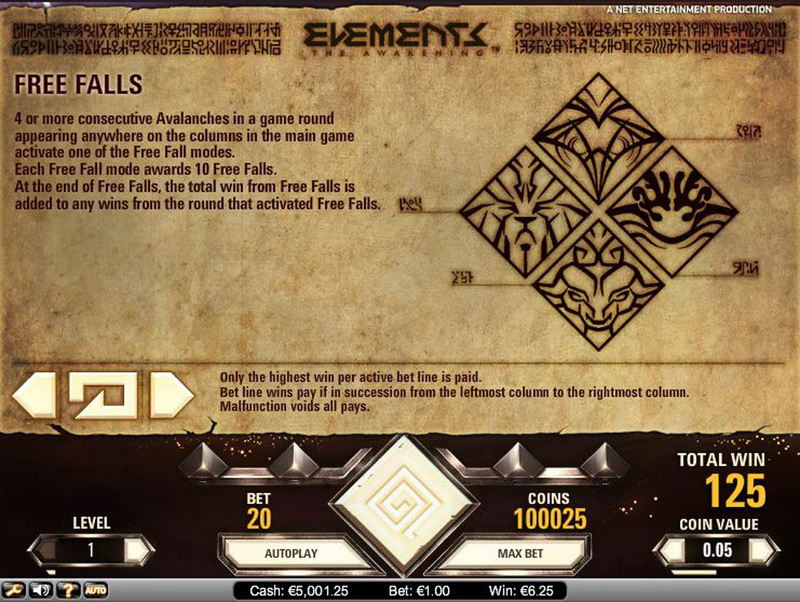 You also need to know that the number of scatter symbols define how many free spins you can take. They wary between 15 and 25. 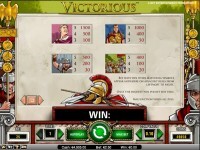 Though Victorious is a plain game with only one feature, I enjoy playing it. The sounds are quite authentic and make you feel like a winner right from the start. I find it a good alternative if you want to go for something basic, but with decent winnings. That free spin feature can be very rewarding. 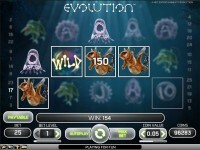 You can play Evolution at Guts.com Casino (read my review of the casino here). 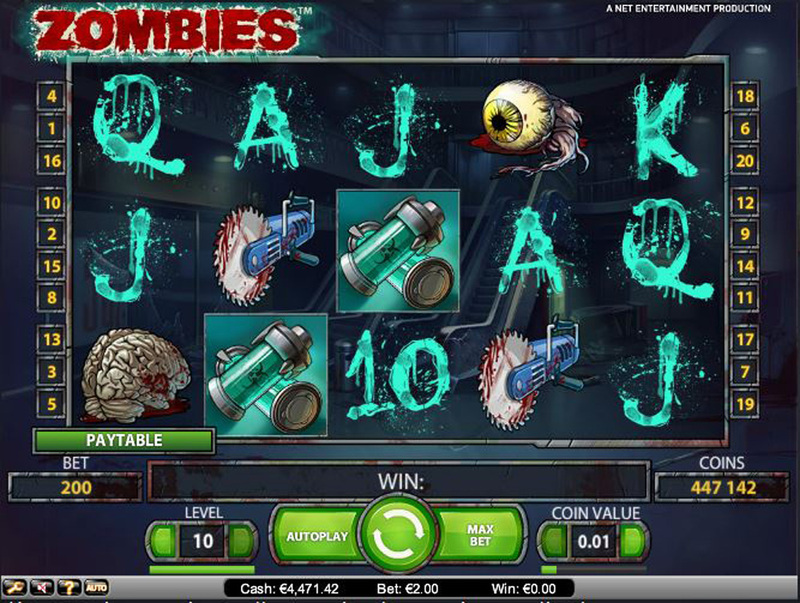 Zombies is an online slot from Net Entertainment, released in 2012. It is based on a theme that is really popular nowadays, that is the zombie invasion. The graphics and the sound effects are quite spooky, but of high quality. Though the layout is simple, 5-reels and 20-paylines, the icons are not for the faint-hearted. There are eyeballs, buzz saws, brains, gas masks and even zombies. The coin sizes range from $0.01 to $1, and the minimum bet is $0.20, while the maximum bet is $200. Besides, the Autoplay and Max Bet options come in handy for all types of players. The Random Wild Feature is triggered when you see 2 zombies’ heads on the reels. Any or all of the 6 symbols that activate it can turn into wild symbols, visibly boosting your earnings. The Stacked Wild is a feature that can only appear on the reel 3. Its graphic is a terrifying zombie. It can appear as an individual symbol, or as 2 or 3 symbols. When only parts on it appear, it is nudged to complete a winning line. 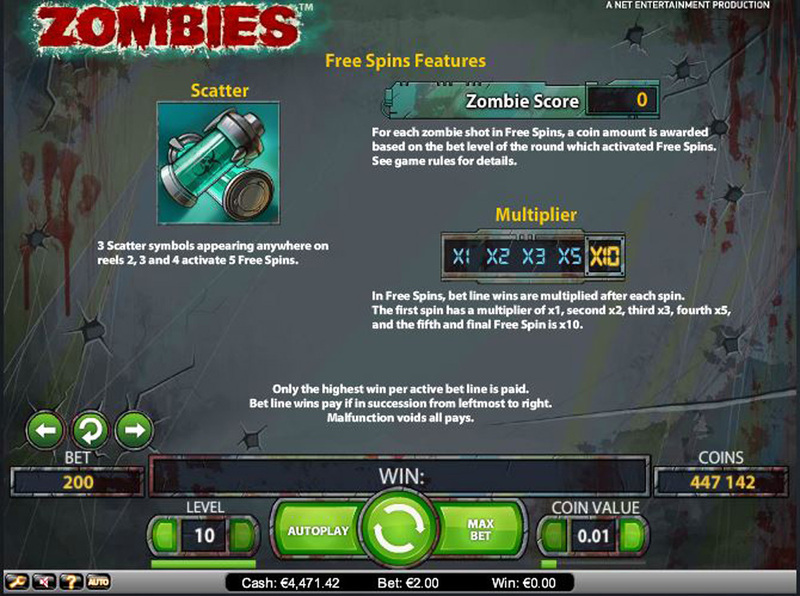 The Free Spins feature is activated when you get 3 scatter symbols on the reels 2, 3 and 4. You will receive 5 free spins. The best part of this feature is that each spin has a guaranteed multiplier. The first spin includes a 1x multiplier, the next a 2x multiplier, the third a 3x multiplier, the fourth a 5x multiplier and the last spin comes with a 10x multiplier. I actually enjoyed playing this zombie themed game. Its major plus point is represented by the high-quality graphics and sounds. The features come with chilling effects, and you always expect to see something crawling on the screen. I’ve had some fairly decent luck on this slot so I play it often, it is definitely one of those slot games that need to be enjoyed at least once, which can be said for most Net Entertainment slots. You can play Zombies at Guts.com Casino (read my review of the casino here). 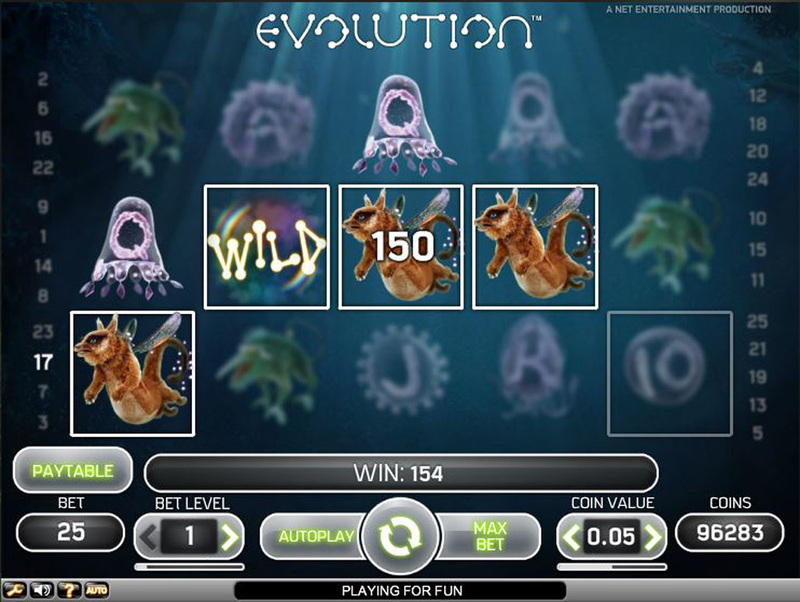 Evolution is yet again another futuristic slot game from Net Entertainment. It has an underwater theme, and incredible sound effects. The graphics transport you into the future, in the reign of mystical and strange creatures. The layout is simple, with 5-reels and 25-paylines. The graphics on the reels are quite impressive and manage to adapt very well to the theme of this game. You will discover: single cells, amoeba and animals that we know today combined with mythological creatures. An interesting aspect of this game is the fact that the symbols actually evolve as you play, and turn into scatter ones. The coin sizes range from $0.01 to $0.50. The minimum bet is $0.25, while the maximum is $125. Unlike other slot games, the reel spins from the bottom to the top, providing a unique gambling experience. 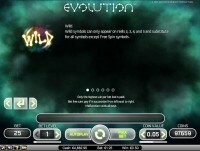 The Evolution feature is activated by a winning combination in the Free spins round. In this case, all the symbols that are in the winning combination evolve to the next level, including wilds. Furthermore, it transports you to a new world with the same high-quality graphics. The more you manage to stay here, the higher the chances to win additional free games. 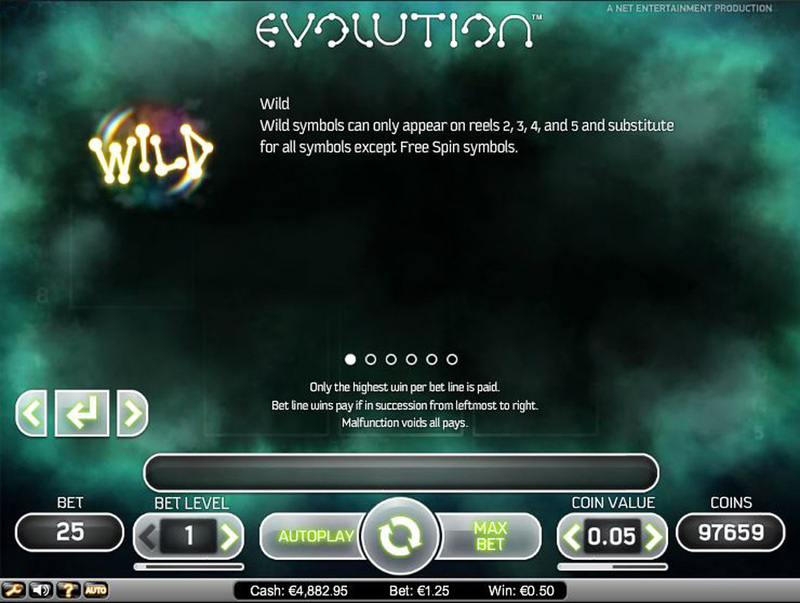 The wild symbol of the game has the property to substitute all symbols, except for the Free spin. It appears on the reels 3, 4 and 5. Its main purpose is to boost your chances of winning. The Free spins feature is triggered when the free spin symbols appear anywhere on the reel. 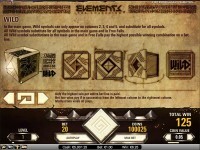 In this case, 3 symbols generate 10 spins, 4 generate 15 spins, and 5 generate 20 spins. Furthermore, you get transported into a new game world. Once you complete the free spin round, you are thrown back by a meteor into the original world. 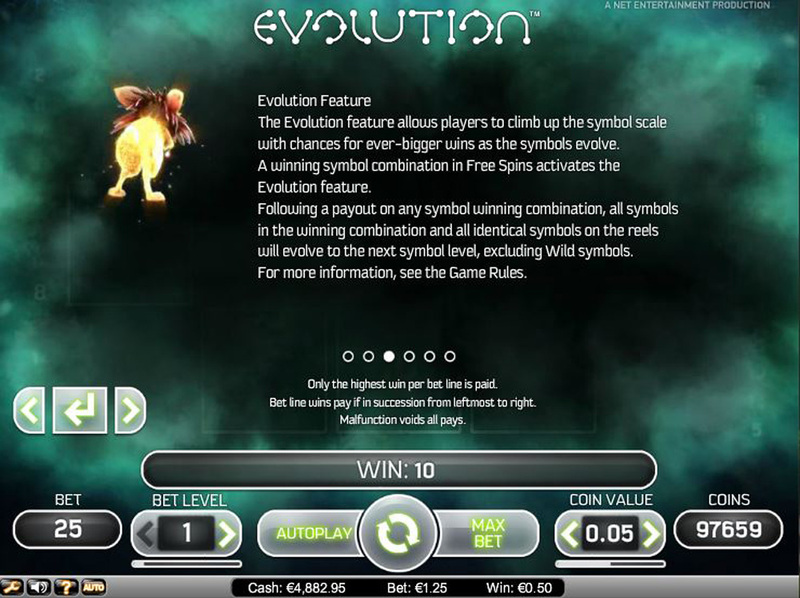 I find Evolution a game with decent winning odds. It truly manages to keep me focused and entertained for hours. The theme is extremely well adapted to the name of the game, as you can find a world within another world. 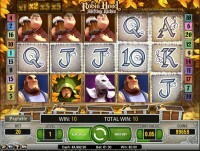 The graphics are so interesting and captivating, and like most Net Entertainment slots, very nice to look at. I also like the sound effects when you spin the reel, it’s like you are under the sea.